This self-defense Honshu push dagger features a black 7cr13 stainless steel blade with double edges and a rubberized, contoured grip for pure thrusting power. 5 3/4 in. overall, 4 in. blade. 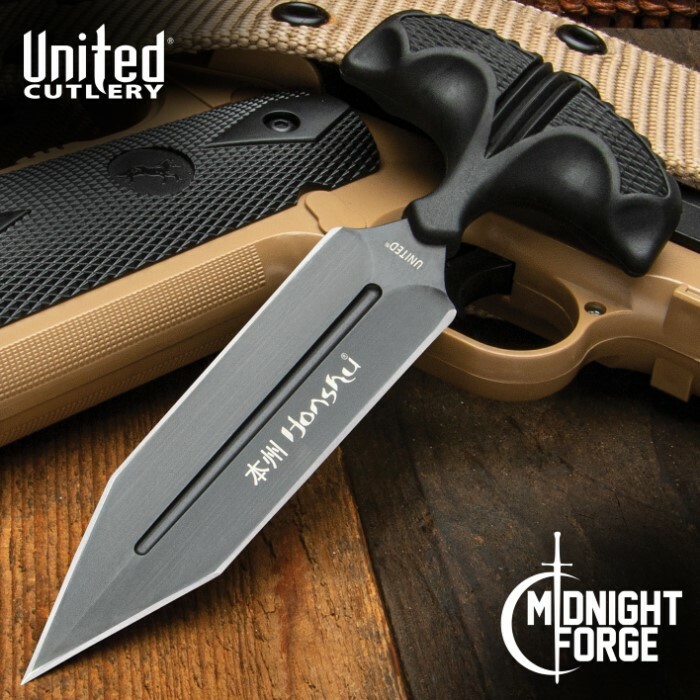 I am not generally a fan of "tanto" tipped blades, but this knife has proven very sharp with the double edged design with good width of penetration. If you've received professional training in how to punch (boxing, krav maga, muay Thai, etc), this transfers exceptionally well with very little adjustment in technique. Striking against an empty 5 foot tall cardboard box, I felt no resistance and the box didn't move at all until the blade went knuckles deep into the box with a simple jab. 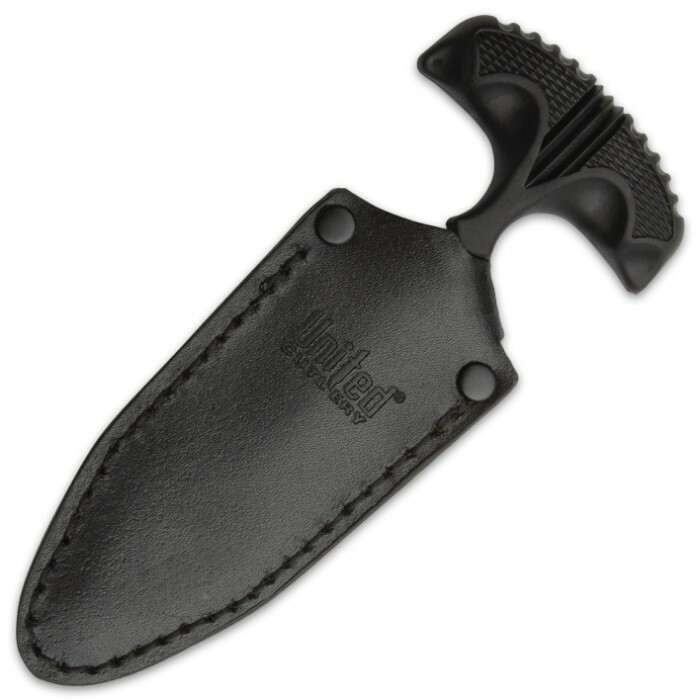 Comes with a very slim and durable leather sheath you can conceal even better than a more traditional knife and way easier than other self defense items. stick inside your waistband or boot (check your local laws for statutes surrounding concealed weapons before you buy this, as it may constitute as a crime to own or possess this blade in different jurisdictions). The only complaint I have is that the metal belt clip that holds onto the belt, grips my belt so hard that it ruins the finish on my belt every time I remove it and have ruined the finish on two of my belts. This is a great knife, it cam in around 7 days, OK shipping. The knife came sharp and even works as a boot knife. I really like the leather scabbard that comes with it.very sharp and fast delivery.very good buy. Very well made both the knife and scabbard. The only caution for me is the sharp edge is carried too far back towards the handle. If you have big fingers be careful how you grab it. So I bought this thing for ten dollar Tuesday and I have to say, I'm impressed with this one. It's the first push dagger I've ever owned, and it's a good one. The grip is amazing, feels great in your hand. The point came sharp as heck on it, but the blade not so much. Nothing a little sharpening can't fix. The clip is really nice as well. I carry this dagger on the back of my pants with my shirt pulled over it. I hardly notice it's there. This is a great purchase and I would consider getting one for yourself! WELL CRAFTED, WELL MADE, AND VERY WELL CONSTRUCTED!!!! UNITED HAS A CLEAR WINNER WITH THIS LATEST OFFERING---HOLDS A SERIOUS RAZOR-SHARP EDGE & WILL PERFORM WELL DEFENSIVELY & OFFENSIVELY!!!!!! !